A writer has been hired to pen a fourth installment to the Girl With The Dragon Tattoo series by author Stieg Larsson, its Swedish publishers have said. David Lagercrantz will write a new story about the characters of Lisbeth Slander and Mikael Blomqvist, which is due for publication in August 2015. Larsson died in 2004 aged 50 and had started work on a fourth novel. The original trilogy sold more than 75m copies worldwide and has been turned into both Swedish and Hollywood movies. 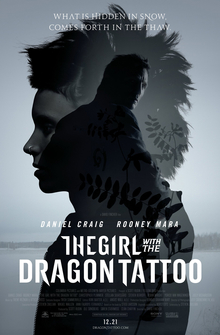 Daniel Craig and Rooney Mara played the lead roles in the US film version of the story, which was directed by David Fincher. Read More BBC News – Girl With The Dragon Tattoo sequel to be written. This entry was posted in News from the Soul Brother and tagged David Fincher, entertainment, film, Girl With The Dragon Tattoo, Hollywood, movie, Stieg Larsson. Bookmark the permalink.